Located at strategic locations and away from hazardous plant, iTech towers have a reasonable proximity to railway stations. The floor usage is maximized with a structural floor loading of 12 kPa as well as the optimized air flow with high headroom slab-to-slab superior to 5 meters and 3.5 meters clear head room. The carrier neutral policy is to encourage the presence of multiple carriers inside the building. Full ownership and long term commitment or service agreement is possible with the customer. These high-tier data centers are designed and built for the requirement of high availability and ready for BEAM Plus and LEED certification. iTech data centers all includes dual 11 kV feed from CLP’s transmission ring, dual TBE room, multiple HV and dedicated transformers for data center use and BMS to monitor all critical facilities. Data centers setup is fully redundant with uninterruptible 2N UPS power supply and 15 minutes battery backup to support mission critical operation. High power density with presence of major FTNSs and diesel generators with onsite fuel storage to support continuous operation are implemented for ensuring the backup. Onsite Computer Room Air Conditioning (CRAC) to control the temperature and humidity. Environmental control in data center by N+1 CRAC. FM-200 / Novec gas based and / or pre-action sprinkler fire suppression system. Onsite fuel storage supports 24 hours of continuous operation plus refilling. Water-cooled chillers as the primary N of cooling; air-cooled chillers as standby for fail-over. 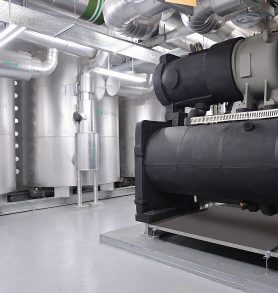 Thermal buffer tank to ensure continuous chilled water supply: N+N or N+1 cooling provision from chillers. 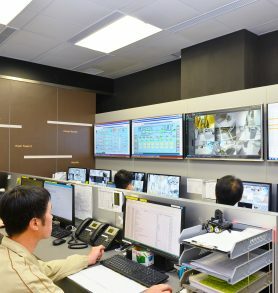 Highly efficient chillers with redundancy to maintain the computer room environment. Experience engineers to provide 7x24x365 onsite support to ensure the data center environment on mission critical operation. 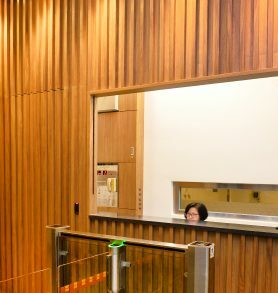 Operation team to carry out routine operation, manage change and maintenance and security control to protect the premises from building entrance, access control in lifts to private suites. Manage the cabling facilities to ensure sufficient space for fiber / copper connectivity for today and tomorrow. Carrier neutral policy is set to encourage telecom carrier’s presence in the data center building. 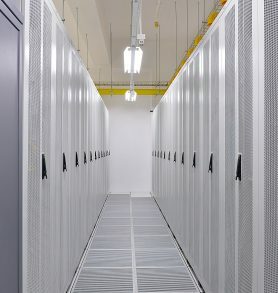 Located in Tsuen Wan, iTech Tower data center is a high headroom data center building converted from an industrial building. The facilities are designed and built to meet redundancy and diversity requirement. Vertical paths for power, cooling and telecom cables are provided to ensure desirable & long term operation. 10-storey building, 1,500 rack space from the 5 data center floors. Full ownership and long term commitment. 190,000 square feet and 12 kPA floor loading. Diesel generators backup system. Inergen / FM-200 gas based fire suppression system and / or pre-action sprinkler system. Located in Kwai Chung, iTech Tower 2 data center is a purpose-built 15-storey Tier III+ (Tier IV ready) data center building. It is designed to meet the latest power density, redundant power and cooling, and more importantly efficient operation. Target customers include banking & finance, cloud computing and major enterprises. 15-storey building, 1,400 rack space from the 8 data center floors. Slab to slab of 5.3 meters and 3.5 meters clear head room. 108,000 square feet and 12 to 20 kPA floor loading. Diesel generators backup system.